If you dream of horseback riding on the beach with your equine partner, check out the below. 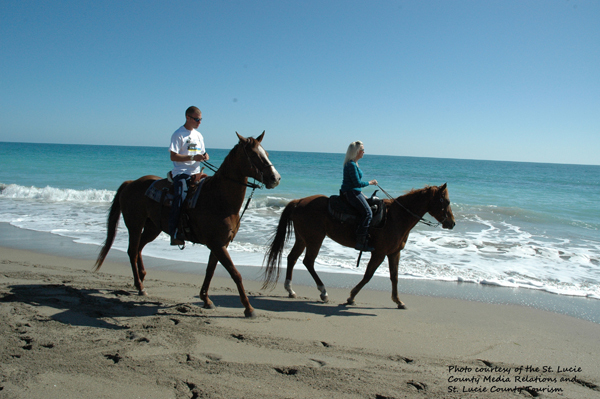 Horseback Riding on the Beach Fort Pierce, Florida. Photo courtesy of St. Lucie County Media Relations and Office of Tourism. Equitrekking.com has taken you on beach rides before. Here are a few more options for you and your horse this summer. New England’s Cape Cod is best known for its whaling past, but several beach parks allow visitors to explore the Cape’s storied dunes from the back of a much smaller beast -- your own horse. Sandy Neck Beach Park looks out across the entire Cape Cod Bay and 2 miles of the historic beach is open to riders. In 1826, $3,500 was earmarked for a lighthouse to be built at Sandy Neck to safely guide fishing and whaling ships into nearby Barnstable Harbor. Though the lighthouse eventually went dark, it was renovated in 2007 and is the first stop on the tour of the Cape’s 15 historic lighthouses. Further up the road, in Provincetown, there are horse trails along the National Seashore that take you to the very tip of the bay. However, riding here is often restricted to October through May, so call first to see if they are allowing rides off-season. If you are looking for somewhere charming to hang your halter, look no further than the Cape Cod Bed & Barn in Brewster. It offers a quaint cabin with amenities and a barn close to both the seashore and Nickerson State Park. For anyone who has daydreamed of galloping their horse through the waves on a deserted beach, Hutchinson Island on Florida’s Atlantic coast offers the perfect opportunity. Frederick Douglass beach has miles of sand and surf for you and your horse. The best part: riding in the water is encouraged! At low tide, horses can wade through the blue waters and spot tidal pools. What you will need to enjoy your moment in the sun: an updated Coggins report and a permit from the St. Lucie County Tourism Office. Weekly permits are $100 for nonresidents and cover two horses. Long Beach Peninsula is one of the longest beaches in the United States boasting around 28 miles of unspoilt Washington coastline. History buffs and their horses can reenact the terminus of the Lewis and Clark Expedition as they ride between the evergreen-lined beaches of Leadbetter Point State Park and the craggy rocks of Beards Hollow. The exhilaration of galloping across sprawling beaches and through sea spray will take you back in time as you realize this must have been what the expedition members felt like when they first laid eyes on the Pacific! There are several barns in the area, including Red Barn Arena and the Peninsula Saddle Club (which has beach access) that will house your horse as you embark on the Pacific Northwest trek. Just off the scenic -- but very winding -- Highway 1 in California is the city of Pismo Beach. Most visitors are drawn to the eucalyptus groves that offer shelter to the millions of Monarch butterflies that migrate there during the winter. If you’ve never been before, it will astound you. At first glance, there doesn’t seem to be anything but branches drooping with heavy leaves. Then one of the leaves begin to flutter and you realize that there are actually thousands of butterflies clinging to one leaf. While you can’t ride on Pismo Beach itself, adjoining Oceano and Grover Beach have wide stretches of dunes and oceanfront for visitors and their four-legged friends. Keep in mind that many of these dunes trails can become unsafe with too much rain so make sure to check with someone who is familiar with the area before setting out on your own. 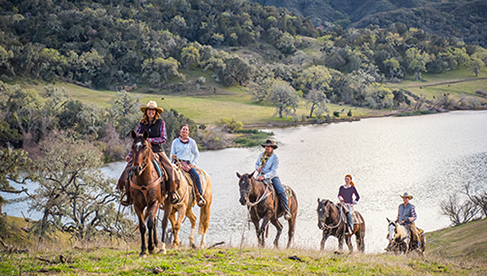 With trails that lead directly to the beach, Pacific Dunes Ranch and RV Resort is a prime location to board your horse during your stay. 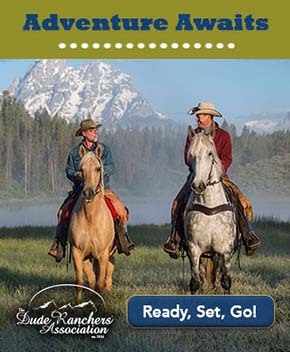 Check out more great ranches and riding vacations where you can bring your own horse in the Equitrekking Vacation Guide. * The above information was correct at the time of this article’s publication. Always be sure to call ahead to make sure you have the proper records and permits for your horse and to check on trail closures due to inclement weather.